I am a full time musician with a band called The Slocan Ramblers. It's been a while coming, but I now make a full time living as a musician. The last five years have been a bit of a whirlwind, touring pretty much full time, making a living on the road. I have had the opportunity to play all over North America, the UK, Europe, and as far as the Middle East. I've been to some incredible places and met some truly amazing people along the way. For me, one of my absolute favourite parts of traveling is meeting people. As a musician, I'm in a new place almost every day, staying at peoples houses, meeting people at shows, or chatting over a pint into the evening after the show is done. I love meeting so many new and different people, hearing their stories, finding out about their passions, what makes them tick. There are so many interesting, unique, and wonderful people out there with such amazing stories and experiences. Every day I have a little window into different peoples lives and communities. I feel like the world is at a really strange place at this point in time, there's not a whole lot of optimism going around, but every day I'm reminded that there are a so many good people out there doing great things in their lives. It helps recharge my optimism, restores my faith in humanity, and reminds me to appreciate how good life can be if you choose to be positive. That's a really hard one, I've been so many places, and have so many fond and different memories. I'm always happy when I see the band has a tour booked in western Canada/US. I love BC, Washington, and Oregon so much. After music my next big passion is fly fishing and the outdoors. I don't get to do nearly as much fishing as I used to as a result of traveling so much. When we hit the west coast, I always pack my fly rod and waders. I get to play music at night, wake up early for a few hours by myself fishing on some of the most beautiful rivers in the world, then watch the dramatic scenery float by my window all day from the tour van. The people, geography, food, beer, coffee, they do a lot of things right on the west coast. That being said, I'm three days into my first tour of Ireland, the people here, the culture, history, scenery, everything here is blowing my mind. So maybe if I was writing this at the end of this tour I would have a different answer. Sometimes being a musician can be really tough, but sometimes you just lie in bed at night and wonder how you get away with doing this for a living. If I really got into all my favourite places we would be here all day. Aeropress Coffee and Espresso Maker: I love good coffee, and staring my day with a quality cup of joe really makes a difference for me. It gets my day going right, and makes for a nice morning ritual. The Aeropress makes a really great cup of coffee. It's quick, easy, compact, inexpensive, and takes two seconds to clean. No more weak depressing hotel coffee! Patagonia Down Sweater: This one might seem a little obvious, but it really is one of my favourite items to bring along with me. It is super comfy, really warm, packs into its own pocket and changes into a really comfy down pillow. There is a reason these are so popular. There's a lot of different companies making similar jackets these days, but the Patagonia down sweater is really well made, and has 800 fill down, so it packs down really small but is still very warm. It looks great too which never hurts. 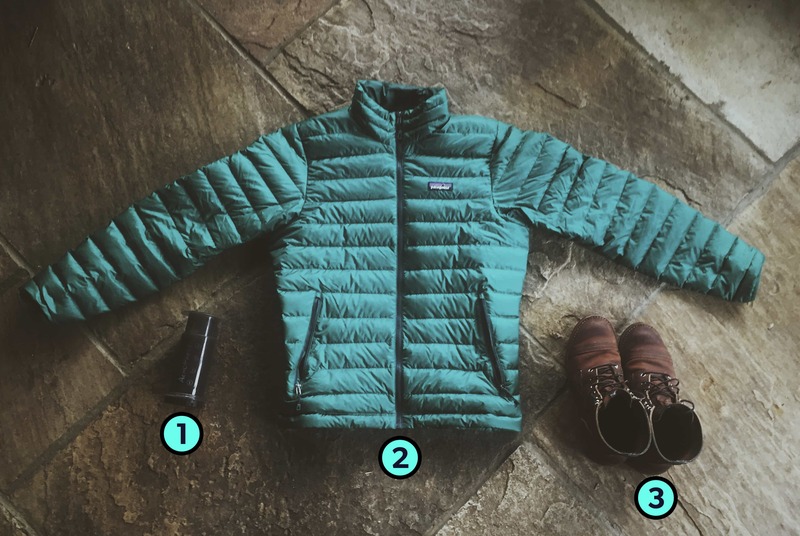 Patagonia's stuff is definitely not cheap, but they usually have a big sale online 2 or 3 times a year. If you sign up for their mailing list you'll get a notification any time they are having a sale. I got my jacket for 50% off. If you forget your phone charger at the hotel, or lose it along the way, you can go to the front desk of any decent hotel. If you say you lost your phone charger and ask if there is one you could borrow to charge your phone, generally they pull out a box over flowing with everybody else's chargers that they also forgot, and tell you to take what you want. Even if you aren't staying at the hotel, I've never had anyone ask what room I'm staying in or anything like that, so it works even if you aren't staying at hotels. I like to think of it as a big non-official phone charger exchange program. There are so many chargers floating around out there, save yourself the money for a new one, and help create less waste going to landfills along the way. Hopefully someone will make use of the one you forgot, and you make use of one that was forgotten. Everybody wins! I always miss my kitchen at home. My wife and I are both very into cooking, and have put a lot of work into setting up and stocking our kitchen over the years. She works as a distiller, so we are also both really into nice spirits and mixing cocktails. We have a very nice collection in the liquor cabinet. My kitchen is my happy place. The first night I get at home, all I want to do is put a record on, cook a nice meal, and mix myself a Boulevardier just how I like it. While I'm on the road I try to stay in Airbnb's whenever possible, so I have a kitchen, or if we are being hosted at someone's house, I always love to cook them a good meal as a way of saying thank you. Nothing beats a home cooked meal on the road. I don't always travel with it, but as I mentioned earlier fly fishing is a big passion of mine. I'm usually on the road when the fishing is good at home these days. If I know I'm going somewhere with any decent fishing opportunities; my rod, waders, and fly box are already packed. I'm usually very efficient with packing, less is always more. It's a huge inconvenience to lug all that around, but if its my only chance to get out on the rivers I won't give it a second thought. As a result I've had some incredible fishing days in Oregon, Washington, Colorado, North Carolina, BC, the Yukon, and Alaska. You never know when you'll have extra time, or where you might run into that perfect pristine trout stream and have it all to yourself. If that happened and I didn't have my gear, it would keep me up at night. Better safe than sorry, so more often than not, I'm driving my band mates insane dragging my fishing gear all over the globe. I have come to appreciate that less really is more when it comes to packing for a trip. I find that every time I pack my bags I pack less and less stuff. I'm rarely staying in one place more than a day, so keeping my packing really organized makes a huge difference. Less time packing and unpacking every day makes more time for a good cup of coffee, time to explore, more sleep if you need it, what ever it is, keeping things simple, organized and efficient makes day to day life a lot easier. I often go through what I brought with me when I unpack after a trip, and if there is something I brought with me that didn't get used, or didn't get used enough to warrant bringing it along, I make a note, and leave it at home the next time around. You would be amazed how little you actually need. Find out what that is for you, and leave the rest at home.